This is the second installment of ScIU theme posts for Black History Month. The authors are ScIU guest writer Marvin Q. Jones, Jr., a graduate student in IU’s Department of Mathematics from Newport News, VA; and Steve Hussung, also a graduate student in IU’s Department of Mathematics. Check out our other Black History Month post here. Margot Lee Shetterly celebrating the release of her film at the SVA Theatre in New York. Hidden Figures, a recently-released movie that captures the pioneering contributions of black women to the space program, is both necessary and incredible — everyone should see this film. We’re going to look at some of the mathematics (and physics) in the movie to talk about space flight. We will emphasize the magnitude of what black female scientists, formerly hidden figures, contributed to the space race and NASA’s space program. Along the way, there may be some spoilers. As a native of Newport News and Hampton, I (Marvin) also know the area well. I, too, was truly inspired by these characters (and real life individuals), and their ability to make scientific progress, despite racial barriers. 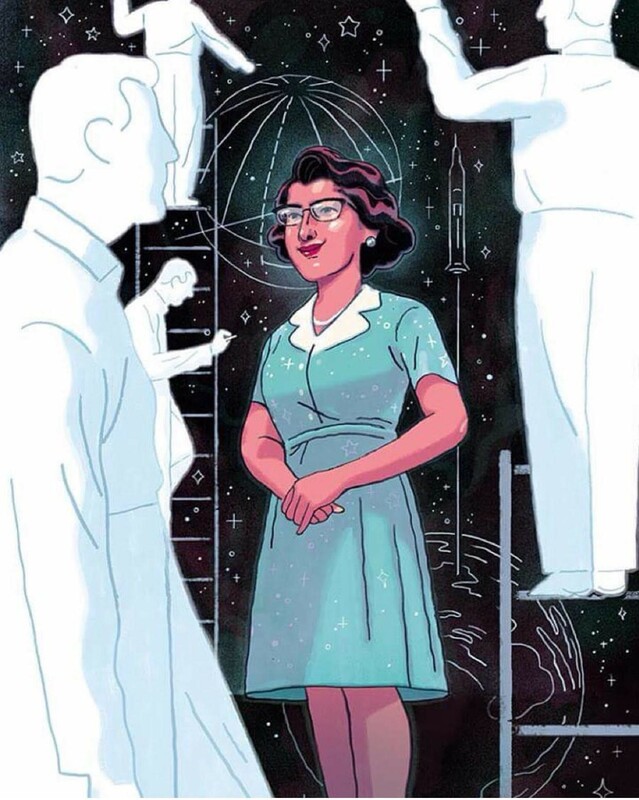 In her book, Margot described the personal and professional lives of many black women who worked at Langley Research Center, and the movie specifically follows three: Katherine Goble (later, Katherine Johnson), Dorothy Vaughan, and Mary Jackson. These women were mathematicians, programmers, and engineers working on various parts of the space program in the early 1960s, and we will explore some of their real-life contributions to NASA’s endeavors. 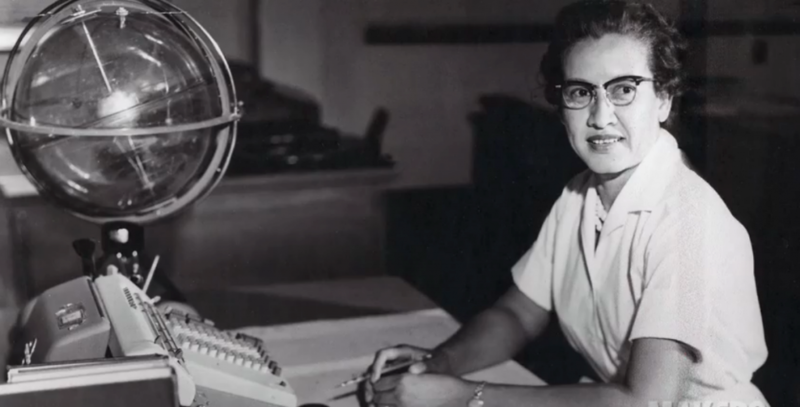 Katherine Johnson at her desk working with her calculating machine. Katherine Goble (above) used her mathematical talents to calculate re-entry and navigation paths for spacecrafts — scientists use these plans to position satellites at the desired location for re-entry. The crux of the method is to make a reasonable guess for the angle at which to burnout, then use this guess to generate a better guess. This is repeated until the guesses converge on one value — the ideal path for spacecrafts to enter and exit orbits. However, making these estimations can be difficult because Earth is not actually spherical. It has “oblateness,” which means it is stretched due to rotation. Mathematicians initially assume that the earth is a sphere in their guesses, and as the oblateness phenomena is accounted for in subsequent formulas, they gradually find improved guesses. While Katherine coauthored a Nasa Technical Note on these topics, she was not credited for many of her other ideas. In the film, John Glenn requests that “the girl (Katherine) check the numbers” — and yes, that actually happened in real life. It wasn’t until years later that Katherine received the recognition she deserved. She was awarded the Presidential Medal of Freedom from former President Obama, and a building at Langley was named after her. Check out these two interviews with her discussing her life and work. One of the only available photos of Dorothy Vaughn (far left, wearing black). Here she is shown at her retirement party with other women of NASA. 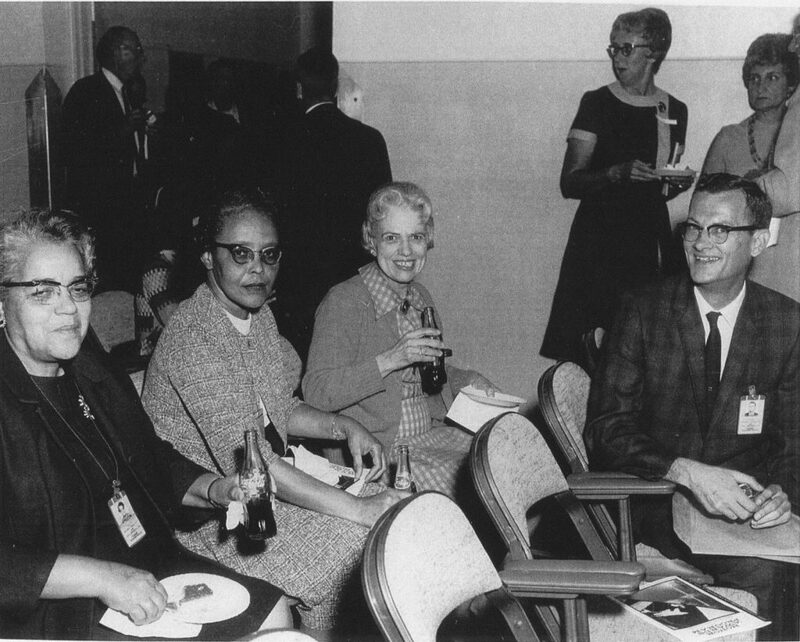 Dorothy Vaughn (above), another main character in Hidden Figures, realized that if she and her black colleagues (then known as the West Computing group) did not stay on the cutting edge and understand the most recent developments in their field, they would not be able to continue working at NASA. She realized that computing was the future of the space program, as well as the work of an industrial mathematician. She took many night classes and, as the supervisor of the West Computing group, encouraged her colleagues to do the same. She learned to use FORTRAN, one of the first programming languages, and became an expert in the inner workings of NASA’s recently purchased IBM 7090 computer. As highlighted in the movie, she moved the West Computing group into more advanced computing, a hallmark of many fields today. The third main character in the movie, Mary Jackson (above), was also a member of the West Computing group, and worked under supervision of Dorothy Vaughn. 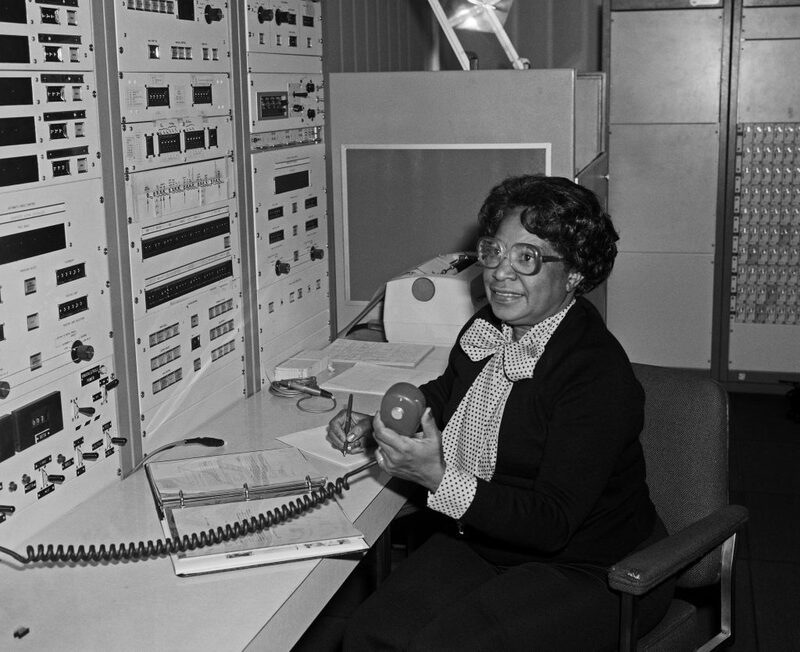 Before being commissioned as NASA’s first black female engineer in 1958, she took classes at the then-segregated Hampton High School through the extension course program offered by the University of Virginia. She worked as a school teacher, then receptionist, then bookkeeper before finally joining NASA in 1951. Mary analyzed real-world flight and wind tunnel data to improve aerospace engineering. She focused on airflow, thrust, and drag. Thrust is the forward force of the aircraft, and drag is force that pushes back due to air resistance. While there is no air resistance in space, drag does occur when entering or traveling through the atmosphere, and increases with the speed of the shuttle. This can be problematic for a rocket traveling at over 10,000 miles per hour. We see Mary Jackson at work in the movie, trying to prevent an aircraft’s heat shield from deteriorating due to the air-resistance pushing back on the cockpit. Vaughn, Johnson and Jackson with the NASA logo and moon backdrop. The accomplishments of these women are even more impressive when we remember the context in which they lived and worked. The movie was set in 1961, when the Civil Rights Movement was in its early stages. Racism and inequality stood as prominent barriers, as did the segregation laws that physically barred the West Computing Group from their white colleagues at NASA. While the West Computers were a collaborative team, they did not work together by choice — they worked in the segregated West Area Computing section at the Langley Memorial Aeronautical Computing Laboratory. According to Physics Today, Johnson was among as many as 50 black female scientists who worked in that laboratory alone. 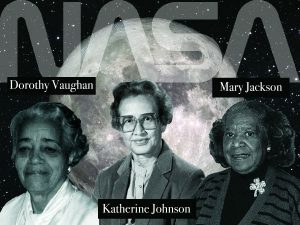 So, the large number of black women portrayed in the movie is not an exaggeration: there really were entire teams of black women alone who made significant contributions to space exploration. Growing up, I (Marvin) did not often see myself represented in individuals in STEM fields; few modeled my dreams of being a scientist. However, the life of these black women has encouraged me personally to keep pushing forward and encourage more “hidden figures” narratives to be told. Sitting down with Steven, the co-author of this post, and talking about our experiences in mathematics, how we experienced the film and even the book, was a great opportunity to bring perspective to each of our journeys as mathematicians. It led to our collaboration on this piece. We hope this has given you a better sense of exactly what these figures gave to the space program during their time at Langley, how their contributions were received at the time, and how they are appreciated today. It is important to celebrate the history of mathematics and science–the whole history. Especially during Black History Month, we should turn our eyes and minds to these black women who have worn the path.We should think about and continue to push the barriers–scientific, racial, patriarchal, and gravitational–that they helped pierce. Edited by Rachel Skipper and Lana Ruck.